If you’ve been on this Earth for a while, I bet you already know that lemons are kind of amazing. They have tons of healing properties and that’s why I love them so much. The secret to their health benefits is hiding in the many nourishing elements they contain. Sоme of them are the well-known vitamin C, vitamin E, vitamin A, vitamin B6, Copper, Iron, Magnesium, Potassium and Zinc. As you can see lemons are up to something and it’s no wonder why they are so popular. 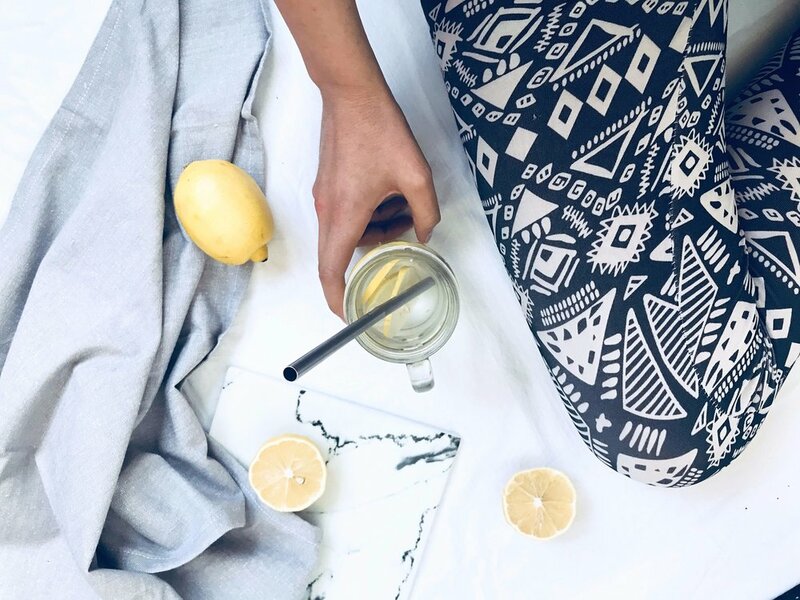 I have some great tips to share with you today so if you want to know how I use lemons in my Beauty Routine, then keep reading. Oh, and by the way all you are going to need is lemons and water. It can't be more simple than that! 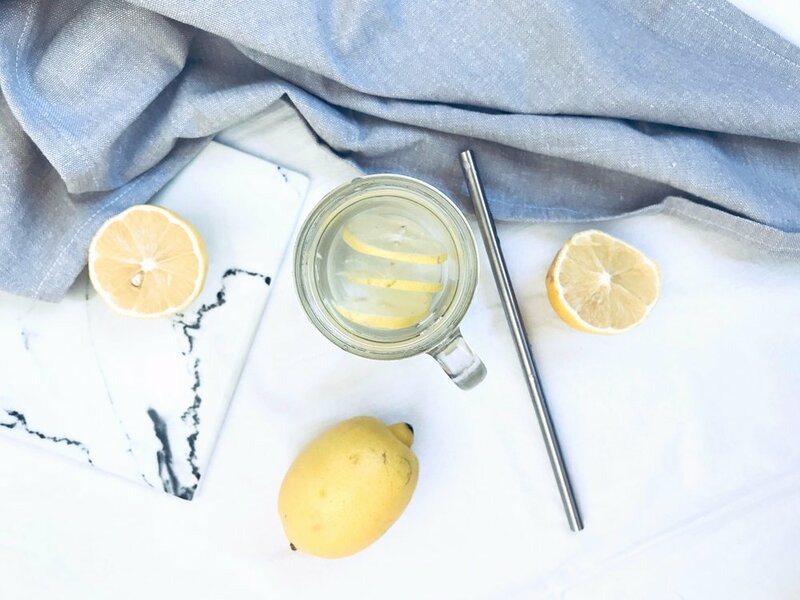 I have wrote an entire blog post for my lemon detox water, so I won’t go in too much detail. You can check it here. What I love to do is to drink a huge glass of water with lemon juice in it, first thing in the morning. This boosts your metabolism, refreshes you instantly and it gives you the best glow in the long run. Sometimes I also add a teaspoon of chia seeds in the water for extra bits of energy or I prepare my water the night before by infusing it with ginger, cucumber and peppermint leaves. It's so refreshing! I had the most thin, fragile nails for my entire life. It was impossible for me to grow my nails and after I’ve tried bazillion things to fix them I finally gave up and accepted my fate. Few months ago I had my nails done in a beauty salon. After the gel, my nails were in very bad condition ( this is something normal, when you have gel or acrylic). I was staying at home wondering how to improve their situation and I got the most genius idea - soak them in lemon water. I don't know why I thought this is going to be a good idea but I am glad I did it. I squeezed the juice of half a lemon and added it to a small bowl with 250 ml of water. Then I soaked my nails and hands for around 10 minutes. I didn’t have any expectations so you can imagine my surprise, when my nails started to grow, and grow, and grow… Without breaking or flaking. They got stronger and harder. And this was the result from only one treatment. Needles to say that the Lemon Soak Bath is now included in my routine. I’ve been doing the famous apple cider vinegar hair rinse for long time and I love how my hair looks and feel afterwards. However, I hate the smell of vinegar so I can’t say that I was enjoying the whole process. What I did is to simply switch the vinegar with lemon juice. I am proud to say that now I have the best hair experience ever (if that’s even a thing). The lemon juice pretty much does what the vinegar is doing for your hair. Which is to condition it, to add shine and texture, to remove the dandruff and to reduce the production of oil on your scalp. All you have to do is to mix the juice of half a lemon with 350 ml - 500 ml of water. Wash your hair as usual, then once you are done pour the lemon mixture on the top of your head. Wait a couple of minutes ( you can even massage it on your scalp) and then rinse it off. That's it! For me this step eliminates the need of conditioner but try it for yourself and see how it will work for you. I realize that this one is a bit controversial, but you should know that for every person on the internet who forbid you to apply lemon juice on your face there is a person who swears to this treatment. As always I speak from experience and lemon juice does wonders for my skin. I realize that this might not work for every skin type, however if you have oily and/or acne prone skin you should give it a try. The lemon juice fights inflammation, reduces the production of sebum, kills acne bacteria, cleans your pores, brightens your skin and fades dark spots. The acidity of the lemon juice also acts as a gentle exfoliator and leaves your skin silky smooth. What I like to do is to rub off the leftovers of a squeezed lemon to my entire face. I leave it for about 5 minutes and then I rinse it off. I do this once every week or so. If you wish to use it daily as a face toner, dilute the lemon juice with water and apply it to your skin. You can wait for about 10-15 minutes and then rinse it off. You most likely will feel the difference immediately. NOTE: You may experience a stingy sensation on your skin, which is totally normal, so there is no need to worry about it. If it gets too strong however, rinse your face with water right away. If you have very sensitive skin, consult with a doctor/dermatologist prior to using this treatment. Well, that is for today, Beauties! I hope you find this post interesting and useful! If you use lemons in your beauty routine, let me know how in the comments below!